Browsing through the menu, we were pleasantly surprised by firstly, the extensive menu and secondly, the innovative presentation. 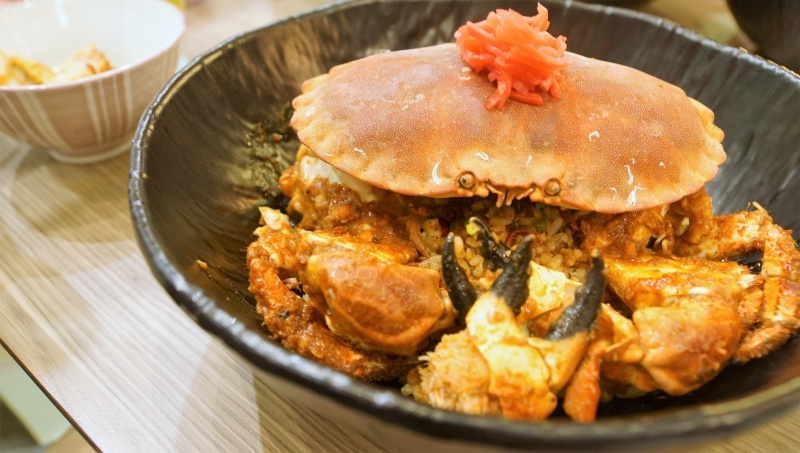 It was clear that this new modern Asian restaurant was set up to challenge culinary norms with their unique twists and styles incorporating influences from Peranakan, Japanese and Italian cuisine. Our appetite grew bigger when we saw the Instagrammable presentation, the only regret we had was that we didn’t have enough stomach space for more. 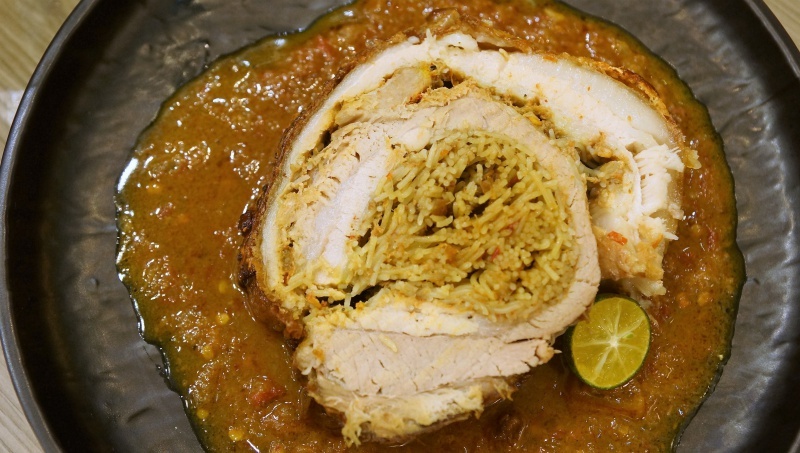 Here are some signature dishes that should not be missed.. 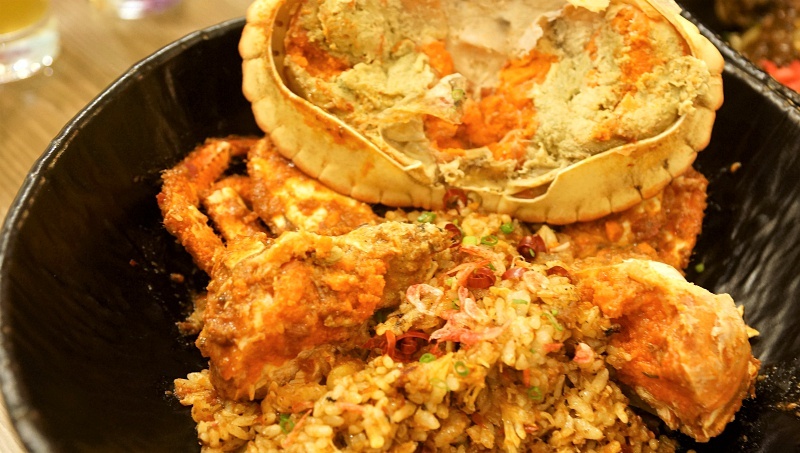 Whole crab served on top of a mountain of fried Japanese rice with diced prawns in a spicy rempah. The female crab was baked and may be a bit dry, but it was full of roe and meat and still tasted sweet. 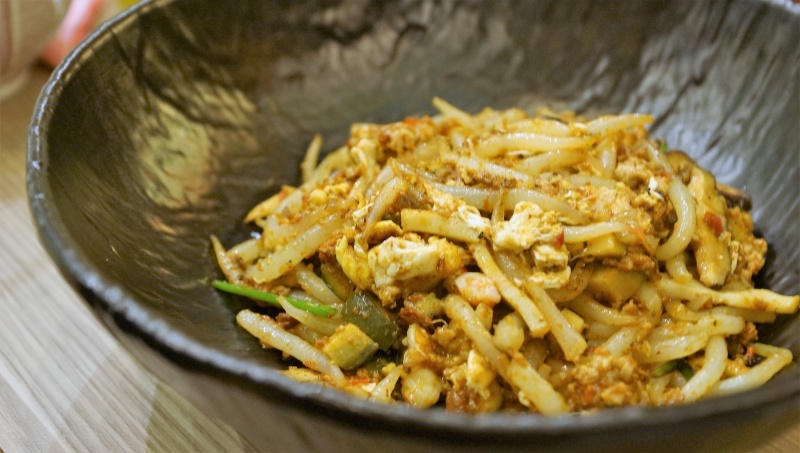 Sambal fried rice is one of our favourite dishes and we’ve tried countless renditions, thus we’re seldom wowed. BUT Uncle Kiisu delivered their version with an impressive touch. The rice may be a little mushy but the flavours of the spices and condiments were infused into the fried rice perfectly, and created an extravagant gourmet experience. Love it. Classic Porchetta but the stuffing was substituted with Mee Siam instead of the usual meat filling. The pork belly was well roasted and fragrant. What was really interesting was the unconventional marriage of the east and west cuisines, the parring and fusion of the seemingly conflicting flavours and the presentation of the dish, which appeared dubious but Uncle Kiisu somehow managed to create a lip-smacking dish that is truly commendable. 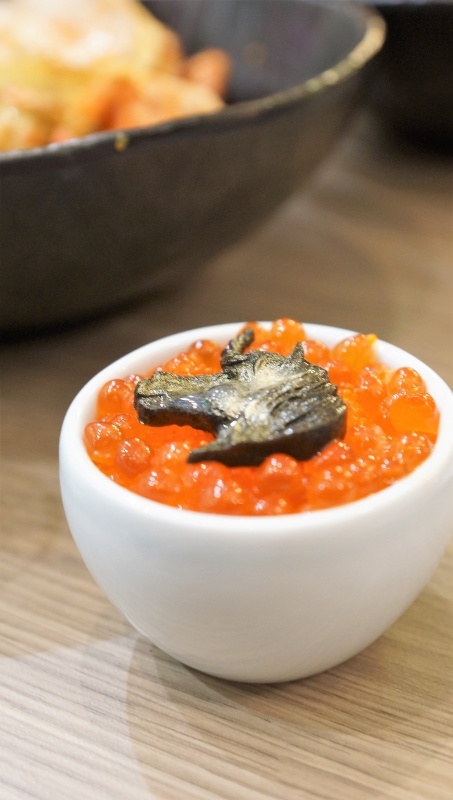 Steamed egg custard with Hotate and Ikura, topped with a black unicorn made of dashi and gelatin that melts in front of your eyes after it is being served! So remember: Be sure you have your phone/camera ready when they serve this dish! The steamed egg custard was topped with Ikura or salmon caviar. The silky smooth-textured steamed egg custard was light and enjoyable, and matched perfectly with the flavourful Ikura. This was a dish that tastes as great as it looks. 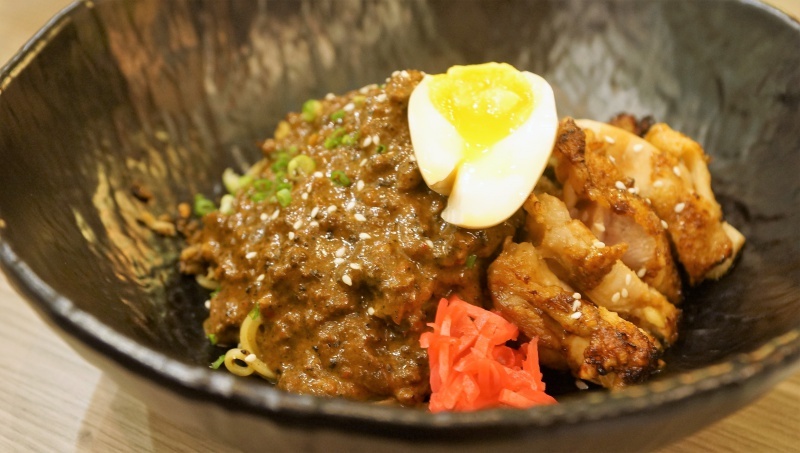 A badass dry ramen noodle tossed in Peranakan Black Gold (Buah Keluak) sauce served with minced pork, a chicken thigh and an Ajitsuke Tamago. At Uncle Kiisu, innovation is in their DNA, many dishes are cleverly designed with unconventionally-paired flavours and unique presentation, that goes with this al-dente Japanese ramen which was adorned with a luscious Buah Keluak sauce. The amazing aroma of the Buah Keluak sauce was phenomenal, enhancing the ramen in both the texture and flavour. Mousetail noodles wok fried in rempah with century egg, minced prawn and pork. The dish arrived on the table with a charred, wok hei aroma which in an instant made our mouths water. The wok-fried mee-tai-mak in rempah had great texture and the minced prawn and pork added a savoury touch, it was so flavourful that we cleared the bowl really quick. Uncle Kiisu created their modern asian flavours in a truly unique way, the special conviction to innovate and unyielding enthusiasm in their food can be felt when you eat there. The unconventional food , flavour fusions and pairings are sure to please your taste buds and take you on a fusion experience that is uniquely Uncle Kiisu. Looking for some interesting food away from the norm? Uncle Kiisu can be a good choice.